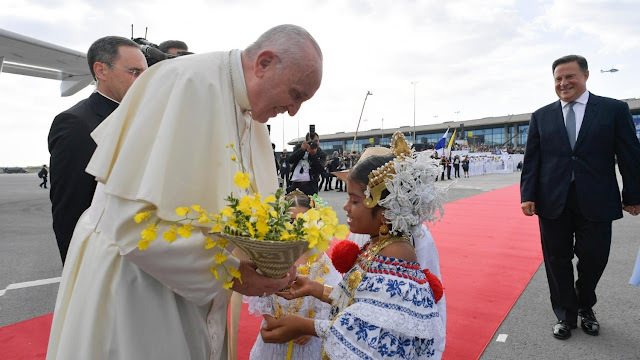 Pope Francis arrives in Panama, Central America for World Youth Day. Thousands of young people, waited for the arrival of Pope Francis in Panama on Wednesday afternoon and even waited at the airport all day. There were dancers with costumes and national dresses for the occasion. The last time a Pope visited Panama was March 5th 1983, and it was Pope John Paul II. The Papal trip from Rome to Panama City is just under 13 hours. Pope Francis was greeted Panamanian President Juan Carlos Varela Rodríguez and the First Lady. On Thursday, Pope Francis will go to the Presidential Palace and meets local Authorities and members of the Diplomatic Corps. He will also have an encounter with the Bishops of Central America. Then he will attend the opening ceremony for the World Youth Day at the Campo Santa Maria di Antigua on the Coastal Belt.